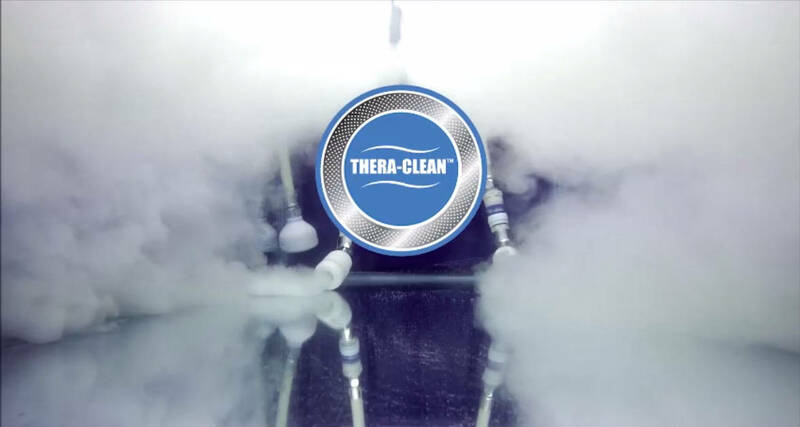 What is the Thera-Clean difference? This is not your typical bath. It is a Thera-Clean therapy bath. A bath that not only deep cleans the hair of your pet but more importantly, it deep cleans the skin using nothing but micro bubbles. Dirt accumulated inside the pores is one of the causes of bad odor. To ensure an even deeper clean, we add an all natural plant enzyme that helps loosen the dirt and debris that is stuck on the skin wall that we can’t see. No soaps, shampoos or any chemicals of any kind are used in this process. It is completely hypo allergenic. When pets are experiencing allergies or skin sensitivities, the avoidance of soaps, surfactants and chemicals can prove extremely beneficial. A Thera-Clean bath reduces odor, reduces itching, ensures no additional skin irritation and improves results of other skin therapies that your groomer or veterinarian may be recommending. So, what are these microbubbles? Simply speaking, micro bubbles are tiny bubbles. To be a micro bubble, they must be less than 1000 micrometers in size. The Threa-Clean system creates millions and millions of bubbles that range from 3-20 micro meters. To put this into perspective, a human hair is 70 micrometers in size and most bacteria is between 3-40 micro meters in size. This is perfect for penetrating hair follicles and skin pores while not passing through the epidermis. How do microbubbles compare to medicated shampoo? Micro bubbles work on a much deeper level than any soaps or shampoos. They offer a whole new concept of clean skin. This means the micro bubble therapy will enhance the efficiency of any other form of“treatment”. Any medication whether administered in the form of a shampoo or orally will function much better due to improved pore and hair follicle condition. This is why the system is being used so extensively in veterinarian hospitals in Japan. How will my pet respond to the Thera-Clean bath? 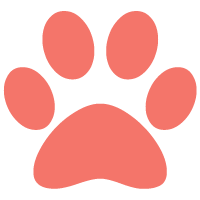 How a Thera-Clean bath can help your pet? It doesn’t get more all-natural than just water and nothing can clean deeper. Most bad odors that come from pets are signs of skin issues deep down within the pores & hair follicles. A Thera-Clean bath now makes it possible to clean out all the irritants that cause bad odour. Constant itching & biting can lead to increased problems. With clean & healthier skin, the itching & biting diminishes and so does the risk of secondary infections. The cleaner the skin and hair, the healthier it is. Healthy hair is stronger, in turn, holding onto the skin for that much longer. It’s a cycle that all starts with the skin. The future of our environment is extremely important. A Thera-Clean bath uses no chemicals what-so-ever. Only a plant and mineral based enzyme is used to assist the billions of micro bubbles lift the debris up from your pets skin and pores. Daily stress and anxiety for a pet can be harmful. A Thera-Clean bath relaxes both dogs and cats to a level similar to a deep tissue massage as the micro bubbles clean their bodies. It is impossible to have an allergic reaction to a Thera-Clean bath. Why? Because it’s just water. A Thera-Clean bath does not require direct contact with already sensitive skin (aside from warm bubble infused water). There are no detergents or chemicals involved and no risk of additional reaction. Whether it’s medicated shampoo or a prescription from a veterinarian, the Thera-Clean bath cleans and clears the pores dramatically. It helps prepare your pet to respond more effectively to other protocols and enhances the efficiency of conventional medicines. Your pet doesn’t have to have a skin issue to take advantage of a Thera-Clean bath. Your pet may look good but there’s only one way to be sure there’s no bad bacteria, that causes skin issues, growing deep down inside the skin. So reward your pet with a day at the spa with a nice relaxing Thera-Clean bath all the while assuring yourself their skin is clear of dirt, debris, and bacteria. 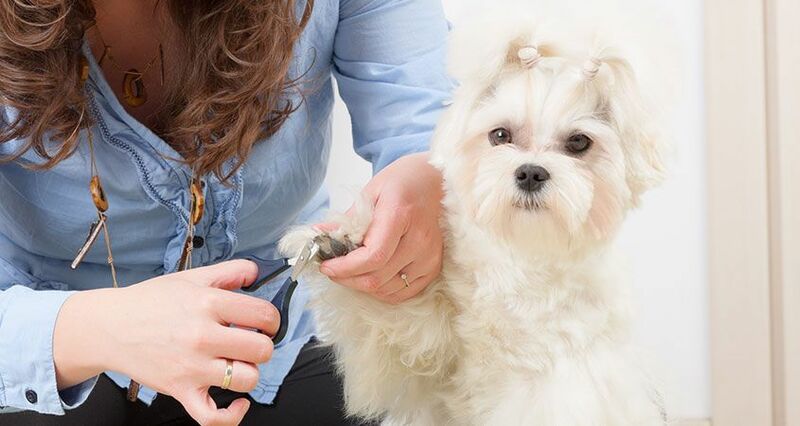 Does your little fur baby have dry skin? Ask for Moisture Plus to be added to your Thera-Clean bath. It will give your pet the much needed moisture boost inside their pores replenishing essential oils the skin needs. Because CLEAN skin is HEALTHY skin. The shampoo (Surfactant) needs to be rubbed on the surface of the skin to make foam, then it takes the dirt off by the surface tension of the bubble. (shown below) You will be giving a lot of stress to the skin barrier by rubbing (act as a stimulus to the skin). When the size of the bubble is not reduced to the micro level, it cannot go into the pore. So it is limited to only taking the dirt off of the surface of the skin. The size of a pore is (30μ m =30/1,000mm) and the size of a micro bubble is (20μ m= /1000-20/1,000mm). The micro bubbles are just water and air. Oil and water repel so the microbubbles alone will not remove the sebum crust on its own. The Toji enzyme powder will eat away at the sebum crust breaking it down and making it softer, in turn the broken-down sebum will be removed by the micro bubbles. 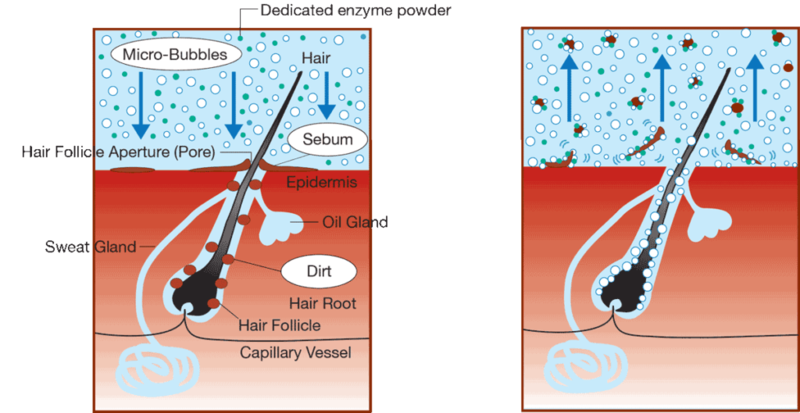 After the sebum is removed, then the micro bubbles travel deep into the pore where it will clean out the pore completely.